We are pleased to announce that the Call for papers is now open for the 3rd International Conference on Economics and Development 2019 – (ICED 2019) to be held on the 13th – 14th June 2019 in Bangkok, Thailand. 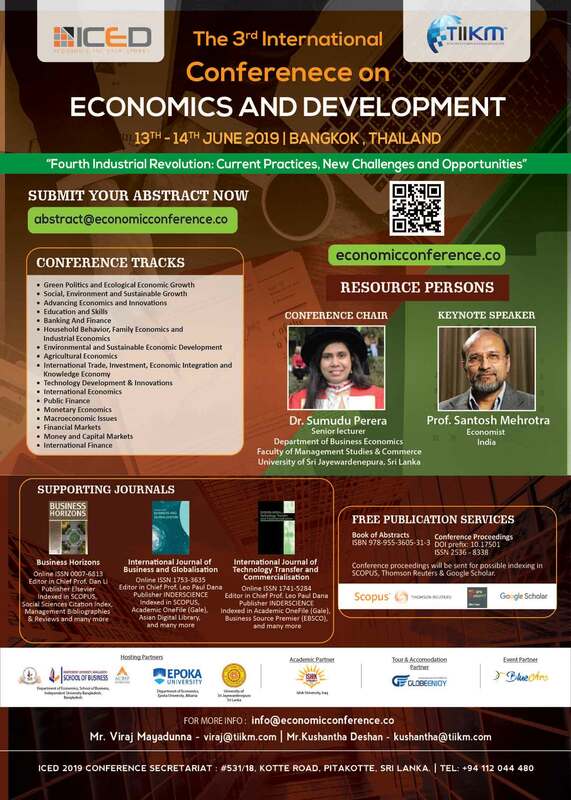 The theme of the conference will be “Fourth Industrial Revolution: Current Practices, New Challenges, and Opportunities.” The 3rd International Conference on Economics and Development 2019 – (ICED 2019) invites economists, academics, researchers, practitioners, scholars, and industry experts to submit their abstracts for the conference. The abstract submission form can be found at https://economicconference.co/abstract-guidelines/ . The maximum word limit for the abstract is 250 words. Please download the abstract template and follow the format carefully. The abstract should be in English, should be informative including a summary of the paper’s background, purpose, methodology, results, and conclusion. Please include a brief biography of the author(s) with your submission. Your abstract will undergo a double-blind peer review by the international scientific committee within two to three weeks after its receipt. The results of the review should be sent to authors within two weeks of submission. Please submit your abstract before 25th March 2019. Submit well before the submission deadline in order to be eligible for Early Bird rates and to reserve your seats for the conference. All full papers sent for conference proceedings will be subjected to double-blind peer reviewing process and will be published electronically with an ISSN 2536-8338 in the proceedings with a DOI Number (DOI prefix: 10.17501). All accepted abstracts for the 3rd International Conference on Economics and Development 2019 – (ICED 2019), will be published in the conference abstract book with ISBN 978-955-3605-31-3. Accepted papers published in conference proceedings will be submitted to Google Scholar, Scopus and Thomson Reuters for possible indexing. The Conference Website (https://economicconference.co/ ) provides additional details about this exciting conference. We hope to see you at the ICED 2019 in Bangkok, Thailand!